Credit unions can differentiate themselves from their local competition by emphasizing focused social or environmental sustainability initiatives. This report provides a helpful template for measuring, comparing, and improving sustainability performance. In 2008 and 2009, a handful of MBA students across the country responded to an invitation from Filene to spend their summer internships at credit unions. These Filene Summer Fellows were drawn to credit unions in the first place by social responsibility, the sense that they could do meaningful strategic work on behalf of organizations that had members' (and by extension, society's) best interests at heart. One of the greatest challenges of the summer fellows program, however, was an unfortunate mismatch: up-and-coming business leaders seemed more interested in credit unions than credit unions were in them. Granted, this was the summer of 2008, when investment banks were rescinding their usual gold-plated offers and previously stable companies were suddenly found belly up in the rubble of the Great Recession. But, despite a resume book full of candidates from business schools like Northwestern, Stanford, and Notre Dame, precious few credit unions were recruiting around this emerging cadre of workers who were as interested in social good as in bulging bottom lines. That continued mismatch - credit unions familiar with the social responsibility movement growing up around them - drives this research into sustainability benchmarking. What behaviors should you measure? How can financial institutions construct their own sustainability profiles? This research provides a point-based report and template for credit unions that want to measure, compare, and improve their own sustainability performance. Nine credit unions, ranging in asset size from $80 million to $12 billion, participated in the study. Their performance provides the baseline for other credit unions; it is also matched (favorably) with the performance of 15 independently held, sustainability-focused banks. Filene used the B Impact Assessment tool, which measures both social and environmental aspects of the credit union. Instead of asking just about recycling or green buildings (although those are included), the assessment considers factors such as governance, including mission, structure, and engagement; workers, including job flexibility and management communication; community engagement, including local giving and job creation; and environment, including land use and sustainable sourcing. scales, sustainability-oriented credit unions can still improve on issues like writing environmental and social stewardship goals into policy, increasing support for child care and maternity/paternity leave, and incorporating sustainability goals into employee reviews. 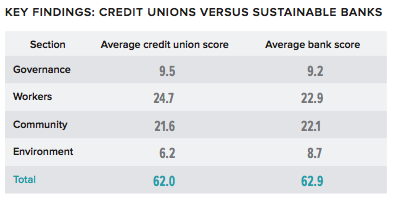 Credit unions are more than halfway there on many important sustainability metrics. Use this benchmarking report to go the rest of the way.